Count on the Brit comic to puncture pomposity at the Golden Globes. Ricky Gervais is hoping he'll have Global appeal. On a recent episode of "Sesame Street," Elmo couldn’t sleep (maybe hard times are weighing even on Muppets). Ricky Gervais shows up at Elmo's bedside, guitar in hand, and announces he's there to sing a "Celebrity Lullaby." "That's when an unbelievably famous person comes over and sings to you," Gervais explains. "What famous person is going to sing to Elmo?" the Muppet asks, wondering if Brad Pitt is on his way. 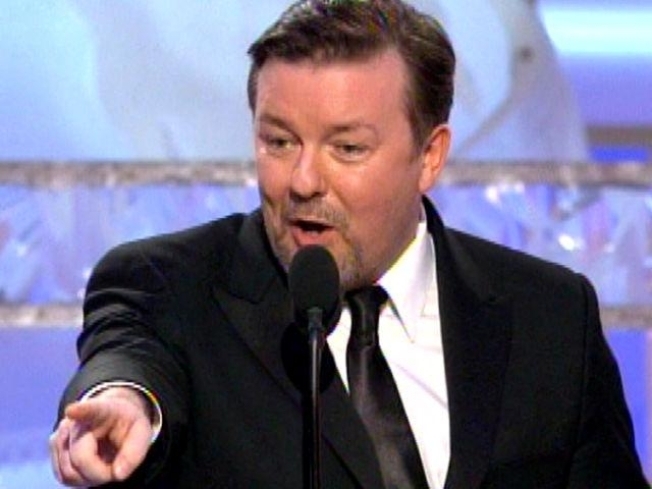 Ricky Gervais is hosting this year's Golden Globe Awards, which is -- according to him -- a mistake. Another mistake is that he can say whatever he wants. An offended Gervais starts to sing softly with an emphasis on "n" (nap, nightcap). Just as Elmo is dozing off, Gervais launches into a fur-raising, heavy metal tribute to the alphabet's 14th letter. The video, a YouTube mini-hit, offers a taste of what we can expect from Gervais as he hosts the Golden Globes Sunday: a raucous, wake-up call where no celebrity is safe. Gervais has emerged as entertainment's prime anti-celebrity celebrity, puncturing pomposity with his sharp wit. Gervais, probably still best known for the original UK version of "The Office," followed up with "Extras," which deftly satirized the celebrity game. Gervais' Andy Millman starts off as a lowly extra, encountering spoiled, clueless actors – including Kate Winslet, memorably clad in full nun's habit as she films a Holocaust movie. "I've noticed if you do a film about the Holocaust, you're guaranteed an Oscar," she said, playing a scheming version of herself on "Extras" – four years before winning an Oscar for portraying an ex-Nazi in "The Reader." In his "Extras" cameo, Daniel Radcliffe plays the brat, flicking a condom onto Dame Diana Riggs' face. Gervais' Millman goes onto to success in a cheesy sitcom that's a lowest-common-denominator hit, and ends up hating himself. He's torn by the perks and pitfalls of fame, which come into clear relief as sits in a club's VIP area with David Bowie only to be mocked by his hero in song as a "Little fat man who sold his soul, little fat man who sold his dream." Millman quits his show, but unable to make it as a serious actor, craves the drug of fame – and winds up trapped in a celebrity edition of "Big Brother." Expect Gervais to channel all these feeling about fame into acerbic humor at the Globes, as he tweaks the self-important. Many of the celebs – like Winslet, Radcliffe, Bowie and others who played flawed versions of themselves on HBO's "Extras" – will be in on the joke. Others may not know what hit them. "It's live," Gervais cackles in the Globes promo that's been running on NBC. "I can say anything. What can they do?" The Globes, thankfully, is generally a much less formal and pressure-filled affair than the Academy Awards. 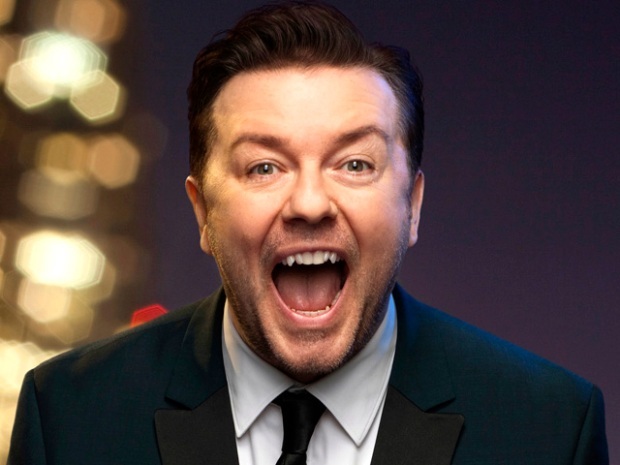 “I'm gonna turn up and wing it, probably drunk,” Gervais told the New York Post. Maybe he was joking. Either way, unlike other long and sonorous awards programs, there's little chance of anyone dozing off during the three-hour Globes affair with Gervais at the helm.